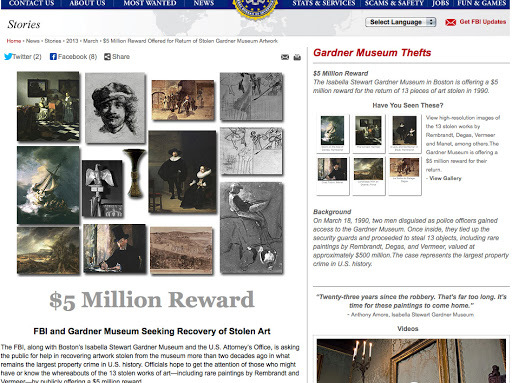 FBI with New Information on the 1990 Gardner Museum Heist? Last week, on March 18, 2013, the day which marked the 23rd anniversary of the Isabella Stewart Gardner Art Museum Heist, FBI announced it had new information about the heist. What followed the announcement has been almost as interesting, FBI has been criticized for releasing no new information, when they solicited information from “those in Philadelphia and Connecticut who may have knowledge of the art’s location”… However, the tips are apparently coming in as FBI is asking for help from the public. The names of these thieves were not released nor details about an attempted sale of the art that dates back to the early 2000s, as it would have been “imprudent”. The reward for the return of the artworks in good condition is at $5 million. FBI admitted that they do not know where the art is at present nor that they are looking exclusively in the Connecticut and Philadelphia areas. So, agent DesLauriers, what was the purpose of your press release promising break news and the new FBI webpage on the Gardner Museum Heist? “With this announcement, we want to widen the ‘aperture of awareness’ of this crime to the reach the American public and others around the world,” said DesLauriers. The reaction in various news and social media sources is as ground breaking “they came, they spoke, they said nothing new.” May the wishful thinking of the Federal Bureau of Investigations feeds our wishful thinking that the art will be recovered in good condition before another decade passes. The United States Attorney Carmen Ortiz stated that her office may offer immunity to those who come forward and provide details about their involvement in the crime, but that statute of limitation on the specific act of theft has run. Usually the statute of limitation starts running from the time the crime is committed but it may be tolled depending on the circumstances. Sources: WSJ; WVCB News; Boston Globe; FBI Newsletter. Previous Previous post: Part I: Who Owns Street Art? Next Next post: Keith Haring Foundation v. Colored Thumb Corp.